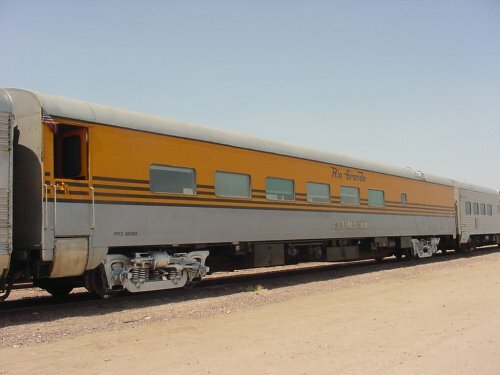 Car 1291, the "Royal Gorge", is a lounge car built by Pullman in 1950 for the Denver & Rio Grande Western Railroad's Prospector billed as "America's Friendliest Train". 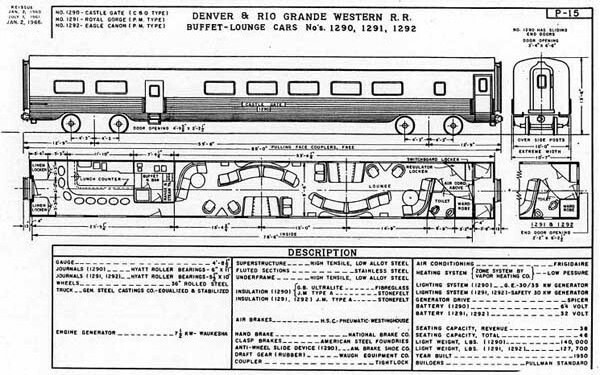 The Rio Grande railroad had three similar lounges 1290-92, one for each consist needed to support the Prospector's schedule. In late 1967, car 1291 was sold to the Pennsylvania Railroad (PRR 1148, later Penn Central 4448, and then AMTRAK 3361). The current owners acquired the Royal Gorge in 1985. Over the last 53 years, it has served untold millions of drinks! Here is car 1291's exterior. 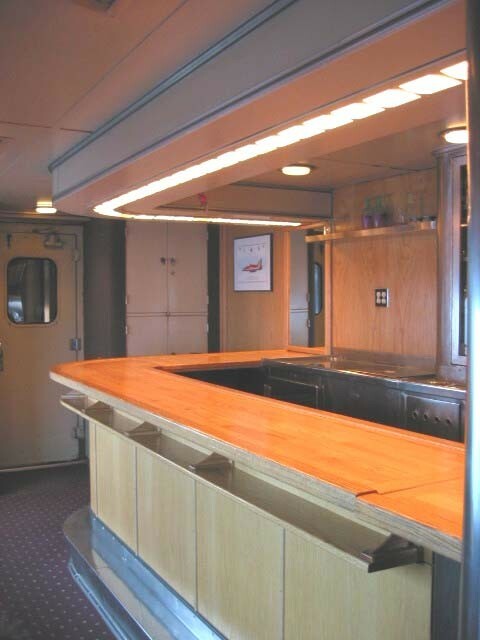 It is an 85-foot "streamline" car. The other side has a small central door for stocking the cafe/bar (see the diagram below the photo). 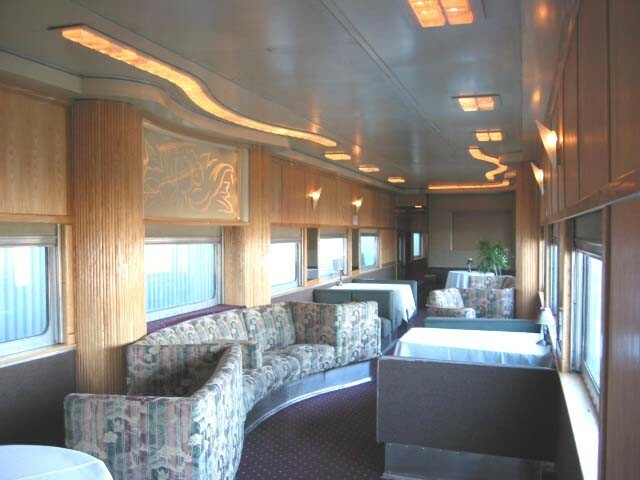 The Royal Gorge is what is known as a "serpentine lounge" car. You will see why in the diagram and photos below. Here is the Royal Gorge's capacity. It has six bar stools now vs. the original eight. Are people are bigger now? What do they call a bathroom on the railroad? The head? No, they call it the toilet. Here is a shot looking into the lounge area from the toilet end. In the distance is the kitchen wall. Note the serpentine overhead lights that follow the fixed seating. It sure looks like the 1950's. Here is the bar area without its stools. Here is the D&RGW Prospector under way in the early 1950's. My Dad, John Wagner, helped build these locomotives. He worked at the Electro-Motive Division of General Motors in LaGrange, Illinois (the home of diesel loco production) from 1938 to 1979 retiring as Director of Production Control (4 years off during WW2 as a USAR commander of a tank destroyer company). I worked at EMD during summers in college. So did my brother John Jr., who you'll meet on the trip. After college, "Tink" stayed with EMD for almost 30 years until they shifted manufacturing to Canada. Then GM transferred him to a senior position at the Power Train division (automobile engines). Ask him about stainless steel castings. Dad must have had a buddy at the Rio Grande RR. Mom was from San Francisco, and we visited her family every three years or so as I was growing up outside of Chicago. 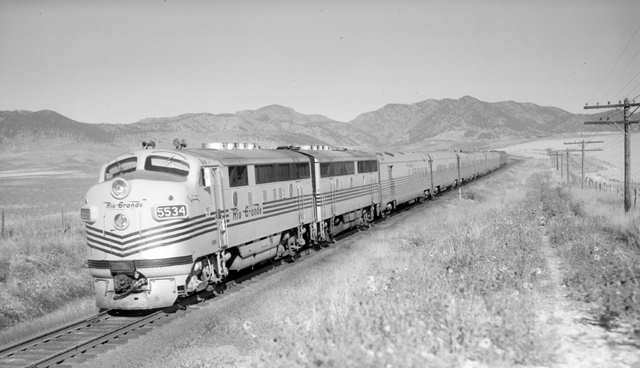 One time (circa 1960), Tink and I got to ride in the locomotive cab thru a whole division on the Rio Grande's leg of the California Zephyr. Every mile there is a signal. The engineer calls out "Light Green", and the fireman confirms by calling out "Light Green". This went on for about 150 miles without a Yellow or Red light. The D&RGW must have had a great train control system as much of the route is single track. I didn't fly on an airplane until I was a sophomore in college as Dad had discount passes on the major railroads.